City Garden Suites is located at 1158 A. Mabini St.Ermita, Manila, Philippines. The telephone number is +63 2 5361451. If you are taking a taxi from the airport or any of the bus drop off points in Manila, the driver probably won’t know the location. A GPS is rendered useless in most parts of the Philippines, so taxi drivers often have difficulty if they aren’t sure of the location. The best landmark is the American Embassy. The hotel is a relatively short walk from there. If you do venture out on foot, be prepared for beggars and people trying to sell you stolen goods. Nevertheless, it’s not too dangerous during the day and early evening. The City Garden Suites is located in a rather run down part of Manila. Actually, this is common in the city. The hotel itself is fairly modern and well maintained, however. The entrance is nice. The reception staff is professional and efficient. I did not, however, get an overwhelming sense of warmth and friendliness. Nobody offered to carry our bags and show us to our room. This was surprising as most hotels, even the budget ones, in the city have a smiling bellhop who picks up your bags and shows you to your room, turns on the air conditioner, TV, etc. We were simply handed the key with a point in the direction of the elevator. The room was large, clean, and modern. It had a relatively comfortable double and single bed made up to hotel standards. The double bed had 4 fluffy pillows and the singe bed had two. The bathroom was clean with hot water and a tub. It contained standard amenities such as soap, shampoo, a blow drier, towels, and tissue. The room had a desk and a small flat screen TV. There was a bar fridge that was rather old but seemed to work well. The fridge was well stocked with beer, soda, water, and other refreshments. There was a box on top of the fridge containing chips and other snacks. As always, everything comes at a premium price. If you don’t want to pay hotel prices for your snacks, there’s a 7/11 and Mini Stop just down the street. There was a large closet containing a safe and a chest of drawers. I couldn’t get the safe to work, however. The closet also had slippers and umbrellas for another fee. Off to the end of the room was a sitting area with a large window, couch, coffee table, and two chairs. The City Garden Suites offers free breakfast. There was a good selection of food both Filipino and American cuisine. The food was well prepared and presented. There was an omelette station off to one side where you could choose the ingredients that go into your omelette. Coffee and juice were also offered. 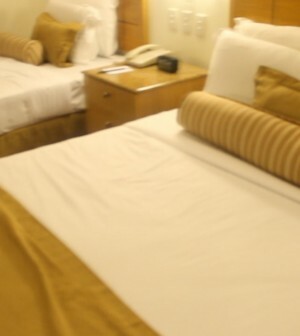 In conclusion, the City Garden Suites offers good food and clean modern rooms at an affordable price. The lack of warmth and friendliness, which is critical to a successful hotel environment, was simply not there. I found the atmosphere and staff aloof, distant, and cold. In light of that, I probably wouldn’t stay there again.